Second Harvest Food Bank of Central Florida, in conjunction with Feeding America and 205 other food banks nationwide are participating in the Second Annual Hunger Action Month. 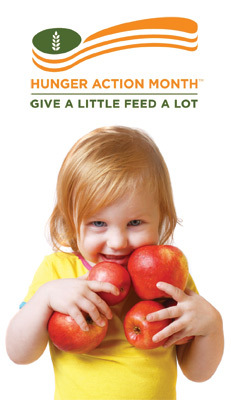 The goal of this month is to mobilize people everywhere to get involved with fighting hunger in America. One in Eight Americans struggle with hunger. That’s why Second Harvest Food Bank of Central Florida is asking everyone to participate in our 30 Ways in 30 Days campaign. Giving a little this month, will help feed alot. I will be counting down our 30 day calendar in weekly posts. Updated information, interviews, photos and videos will be posted to go along with our 30 Ways in 30 Days Calendar. Did you know that we offer informational tours of the food bank? We call these tours Food For Thought. They take place several times a month and we feed you lunch or breakfast (depending on the time of the tour). If this is something that interests you, please make sure you RSVP online. This session is a great way to learn about hunger in Central Florida and what Second Harvest Food Bank is doing to help. Martial Artists Fighting Hunger are hosting a fundraiser for us on Saturday, September 5 at Lyman High School. What exactly is The Gauntlet? The video below will explain it all for you. A huge thanks to Steve Blanton for all his hard work in organizing this event. Steve Blanton is the founder and Commissioner of comBATON and tournament director of all comBATON tournaments including the championships at the Disney Martial Arts Festival in Orlando, Florida. We started a twitter account 6 months ago and have recently surpassed 1,000 followers! If you have an account, you can follow us at @feedhopenow. That concludes this week’s actions. If you want to take a peek at next week’s actions the full calendar can be viewed online. Let us know what you think? We are open to suggestions and criticism. p.s. Don’t forget to share this information with your Friends!